TASTY Cocktail Making Hen Weekend in Newcastle! Cocktail making has been the most popular choice when it comes to hen parties for a number of years, but if you fancy extending your celebrations beyond just one activity, why not treat yourself to this cocktail making hen weekend in Newcastle! This package creates a whole weekend brimming with exciting activities to make you feel special on your hen do, including the renowned cocktail making. Your 2 nights stay will be accommodated by a 3-star hotel right in the centre of Newcastle, making sure that travelling to and from your activities won’t be much hassle. When you arrive at your hotel on the Friday of your choice, you’ll be shown your rooms and have a bit of time to get glammed up before a 2 course meal in a restaurant you’ll choose before the hen party weekend. Whatever restaurant you choose from our list, you’ll pre order both courses so all you have to worry about on the night is drinks! When you’ve polished off your plates, we’ll have provided you with a local bar guide before the weekend to help you on your first hen night out. This guide is full of popular, unique and even quirkier bars around Newcastle to suit any kind of bride to be, and will mean less time walking around looking for the perfect place and more importantly, more time celebrating. Whether you want a few delicious cocktails and an early night, or you want to visit each and every bar in the guide till the early hours, this guide is a great way to finish the first night. Come Saturday morning, there will be a hot breakfast for all the hens to indulge on that may be able to cure a few hangovers before the day ahead. Before the weekend you can choose whether to dive into the cocktail making during the day or leave it as an evening activity, but whatever you decide you’ll definitely have some time to freshen up (and maybe add some hen party accessories to your outfit). Then head over to the city centre cocktail making venue, where you’ll be greeted with a welcome drink and introduced to your bartender. Before you get going, the bartender will give you a quick demonstration with a couple of taste tests, and introduce you to all of the tools and equipment that you can use throughout the session. Then you get a go at mixing, shaking and muddling some of your own cocktails, from classic Cosmo’s to more adventurous creations – it’s totally up to you! Everyone will get to mix 2-3 cocktails each, and of course drink them in your reserved seating area. After you’re all finished learning the tips and tricks of cocktail making and testing each other’s creations, there will be several sharer platters for you to enjoy, full of light bites to soak up all that alcohol. This is the perfect time to chill, chat and get excited about the upcoming wedding before moving on for the night. 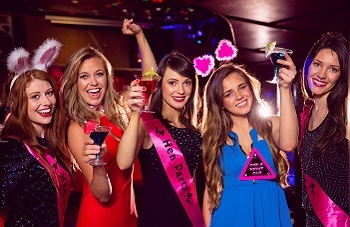 To end the weekend with a bang, this package also includes nightclub entry passes for the whole hen group into Tiger Tiger, as well as a reserved booth and 4 jugs of cocktails to get the night started. Does this jam packed, tasty cocktail making hen weekend in Newcastle sound like the perfect way to celebrate for you? If so, don’t hesitate to call us on 0161 341 0052 and our events planners will be happy to give you more info or organise the whole thing for you!